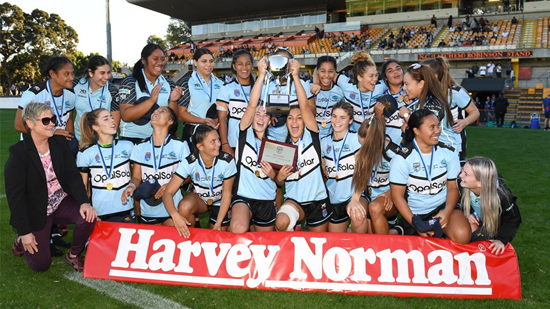 The Cronulla Sharks have finished the season unbeaten after defeating the Newcastle Knights 36-22 to win the 2018 Tarsha Gale Cup. Leading 22-6 at half time, the Sharks held off a spirited Knights’ comeback to claim their first title. Cronulla’s Faith Nathan was the star once again, scoring three tries in the 14-point victory. Nathan, the competition’s leading try scorer, finished with an astonishing 26 tries from just 7 games. Her Sharks’ teammate Madison Higgins-Ashby was named Player of the Year following the win, having scored 19 tries herself during the season. Cronulla Sharks 36 (Faith Nathan 3, Lynda Howarth 2, Zali Fay, Madison Higgins-Ashby, Jaida White tries; Quincy Dodd 2 goals) def. Newcastle Knights 22 (Emily Harman, Caitlan Johnston, Joeli Morris, Jasmin Strange tries; Skye Pullman 3 goals) at Leichhardt Oval.